I was a bit wary of installing Nero 10 on my laptop as its predecessor Nero 9 took several hours to install and had many bugs. The complete suite certainly installed quicker but with a few quirks. To start with, two required additions to my up to date Windows 7 system were needed, Microsoft VC Redist 2005 KB973544 (Microsoft Visual C++ 2005 Service Pack 1 Redistributable Package ATL Security Update) and Microsoft VC Redist 2008 KB973552 (Microsoft Visual C++ 2008 Service Pack 1 Redistributable Package ATL Security Update). It also installs a Reboot Validator whatever that is and gives you an option to install a Nero Ask Bar. 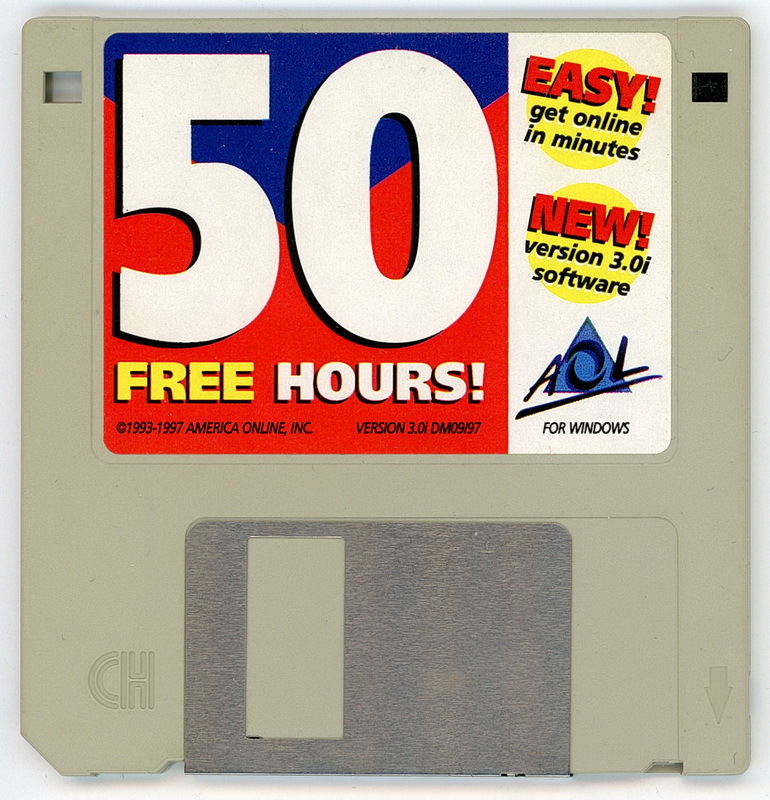 I then had to reboot my PC for these to take effect. I found this a bit annoying as I haven't installed any of the Nero software and I'm rebooting my PC. After the restart and entering the serial number, I got the choice of what elements to install. These include Nero Burning ROM - 156MB, Nero Update - 1402KB, Nero BurnRights - 6442KB, Nero BackItUp - 107MB, Nero CoverDesigner - 75MB, Nero DiscCopyGadget - 33MB, Nero DiscSpeed - 7526KB, Nero Express - 157MB, Nero InfoTool - 8426KB, Nero MediaHub - 157MB, Nero RescueAgent - 6886KB, Nero StartSmart - 109MB, Nero Vision - 213MB, Nero SoundTrax - 94MB, Nero WaveEditor - 75MB, Nero Recode - 79MB, Nero ThemePacks (8 totalling 911MB) and Help Files CHM (totalling 23MB). That's a total of 2219.5MB but the installation won't tell you that. You then have two tick boxes, one for shortcuts and one for the Multimedia Suite to manage the files. If you don't want the icons to change for your existing files and control to be taken away from your existing programs, you should tick yes for the shortcuts but no to the second. The installation then runs each of the installs for the elements you selected. If you chose all of them then that is 39 separate installations, which took about 20 minutes. You don't get any prompts but surely they could have had just one progress bar and one installation rather than dividing it into 39 chunks. Right after it finishes the program runs Nero ControlCenter runs to check for updates. The guide recommends this, but when you click on check for updates, you get a message "ERROR IN YOUR INSTALATION. An Error occurred. Please restart Nero Control Center and try again." After an email to technical support I found out that as the software hadn't been officially released yet, the update server was not reporting the right message. I hope this is corrected as it is not good to have an error message when updating the software and you haven't even used it yet. The ControlCenter does not link to any help files; instead when you click on help you get a message that manuals and help files are not included in this version. This is despite the 211 help files installed, including 14 different languages for each application. 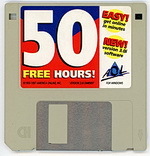 Nero has always had this policy of not including help in their programs to reduce the size of the download. Every other software manufacturer includes help files when you install the software. Is there going be a situation where you want to update the help without fixing a bug in the program? I doubt it, but as this suite did include the help files (48MB of them) it would be nice that all the programs had them or linked to them. I'm sure installers can check what language the operating system is using so there is no need to install 14 different language help files. 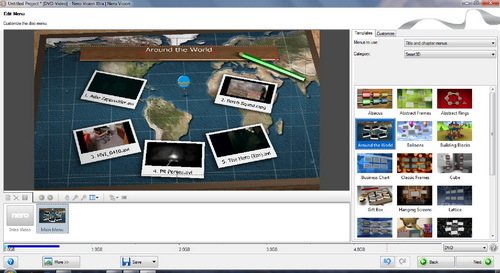 The new MediaHub component is a combined media organizer, media player, photo editor and slideshow creator. Once the directories to watch are set you can import music, video and photos. When viewing photos you can use an inbuilt editor to correct red eye, colour, etc. and some other effects. You have a large variety of controls to tweak your photos, with an undo for each action. Not as good as a dedicated photo editor, but certainly useable. You can also create a slideshow using one of several themes, which are saved for later viewing. There are no editors for the music and video clips even though Nero Vision and Nero WaveEditor are included in the suite. You can publish your media by burning it to CD, DVD or Blu-ray. 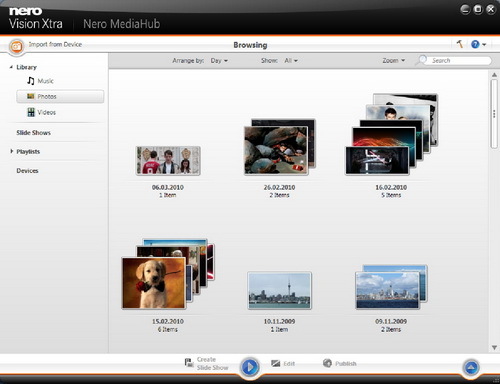 You can upload your media directly to My Nero, YouTube, MySpace, Flickr or Facebook. Just enter your login details and approve Nero as a client and the program will upload your video, pictures or music. Nero Vision has been updated with more tracks and easier tools. Video can be imported from many different formats including vob files, which can be scanned for separate segments and divided accordingly. Smart encoding is now included which saves time if the files were rendered in the DVD format beforehand. Smart Rendering has been available in Corel's VideoStudio and DVD MovieFactory for some time and it helps reduce the time it takes to produce your discs, so it is a welcome addition. The themes for the menus are very good, but parts of the program interface still look like the old version which does not seem to be in line with the rest of the redesign. Nero Burning ROM has a new DiscSpan job which lets you use different disc types. 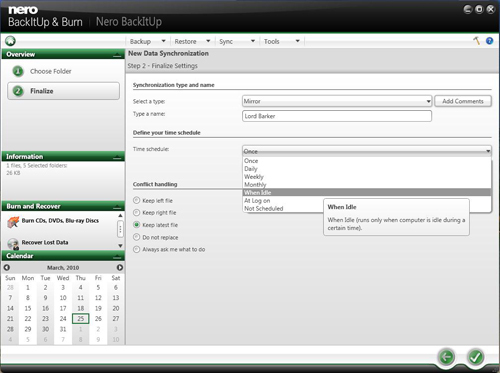 The last disc burnt will include an application to restore the archive so you don't need to have Nero installed. There is a new Burn Now button which bypasses the options dialog you usually get when opening a project. There's now support for AVCHD, a new high definition video format used in camcorders and SecurDisc 2.0 technology helps to prevent scratches and disc deterioration from rendering your data unreadable. In Windows 7 the application can be minimised and a progress update viewed by hovering your cursor over the toolbar icon. Nero BackItUp & Burn asks for a destination drive with enough space to perform the backups, and then automatically sets up everything else to ensure your data is regularly saved. Automatic back up is performed every two hours by default, but this can be changed to when the computer is idle or boots up. You can also schedule a backup on a particular date and time. Overall there are plenty of applications, but it still feels like a mismatch of designs as some applications have not been given the complete makeover. The MediaHub is a convenient program that seems to duplicate Windows 7 MediaCentre with a few extra features but is the best addition to the suite. 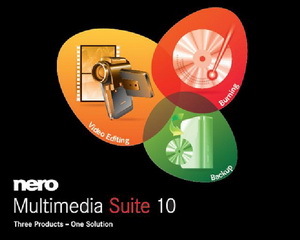 Nero Multimedia Suite 10 is available from April 12th, at a price of £60 (inc. VAT). Nero Vision Xtra including MediaHub is available separately at £50, Nero Burning ROM at £40 and Nero BackItUp & Burn at £30.